With demanding jobs, jam-packed schedules, and never-ending lists of responsibilities dominating most of our lives, it’s only natural that our minds sometimes wander to somewhere else—anywhere else, though preferably somewhere near a beach that includes a big drink with a small umbrella. But luckily, you don’t have to wander too far to get off the beaten path: All your vacation daydreams could soon become reality, even if you’re down to your last day off. There are a number of small wonders dotting the country, many of which are just a weekend road trip from some of its biggest metropolitan areas. These getaways may strike the perfect balance to cure the overworked blues: close enough to be accessible, but far enough away to feel like somewhere else altogether. If you’re looking for a hard refresh on your routine but are hard-pressed on time, you may want to check out some of these just-outside-city-limits road trips. Don’t see your closest metropolitan area here? Don’t worry. We have even more weekend road trip suggestions than you might have thought! Point Reyes National Seashore in Northern California. Traffic in San Francisco is bad. Really bad. But even with that top-notch congestion, it shouldn’t take too long to get away from the swarming city streets—and back to nature. 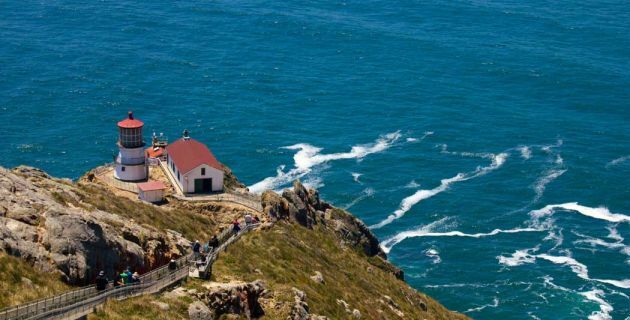 Point Reyes National Seashore is a weekend road trip that’s less than 50 miles away from San Francisco proper, but the lovely stretch of seaside cliffs feels like an entirely other world. The park in and of itself is a beautiful destination—and a fruitful one, with opportunities to hike, bike, backpack, kayak, fish, ride horses, and even have a beach bonfire. But along the way, you’ll also pass a number of other worthwhile stops that will help leech the big city stress right out of your muscles. Not long after crossing the Golden Gate, you’ll come across the Muir Beach Overlook, a standout spot even along the standout road of Route 101. Further north is Stinson Beach—a popular Marin County shore spot filled with all the trappings of a quiet and beautiful beach town. And the neighboring community of Bolinas is any idealist’s dream, home to a bustling art scene and a number of farm co-ops. But all that exploring is hungry work, so make sure to also hit Point Reyes Station, a town just outside of the national park that’s particularly known for its exceptional restaurants. Horsetail Falls outside of Portland, Oregon. The state’s most populous city may be known for its weirdness, but not taking advantage of its proximity to some of the country’s most beautiful roads would be far stranger than the city. The nearby Colombia River Scenic Highway is America’s first officially designated “scenic” route, and quite possibly its best—just don’t tell that to the rest of its official picturesque roads. If you’re blessed with good traffic conditions, you can reach the road from the city in just over a half-hour. Once you’re on the stunning stretch, you’ll be treated to endless river views featuring mossy rocks, tall pines, and fields of wildflowers. And of course, lungs full of complimentary fresh air. The road offers many beautiful places to pull over and appreciate Oregon’s natural wonders—or hit any number of nearby trails. Waterfall lovers are also in luck: The highway passes by plenty of impressive examples, including Bridal Veil Falls, Multnomah Falls, and Horsetail Falls. But one of this weekend road trip’s most most impressive features is Cascade Locks Marine Park. Located less than 50 miles northeast of Portland, it’s a place where you can enjoy everything from art and museums to abundant outdoor activities to the aptly-named Bridge of the Gods. 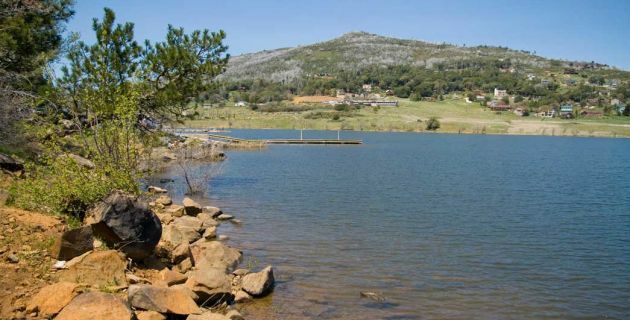 Lake Cuyamaca outside Julian, California. In the land of Endless Summer, sometimes you just need a good autumn kick. Luckily, the mountain town of Julian is just a 60-mile trek northeast of America’s Finest City. The former gold mining hotspot is now a quaint historical community, brimming over with cozy charm and delicious, hardy meals that would just seem out of place in nearby San Diego. It helps that the weather is nearly always colder in the elevated town. Julian is even known to get snow—an unthinkable phenomenon in the coastal city. During the actual fall, the area offers all the traditional cold-weather activities like pumpkin picking, hayrides, and horse rides, and the apple cider made there pairs perfectly with the area’s famous apple pies. But Julian is enchanting—and refreshing—in any season, especially for those who’ve become accustomed to slick high rises and overpacked beaches. The drive there isn’t bad, either. There are several routes one can take from San Diego, but utilizing state highways 67 North and 78 East will take you through the winding backcountry, where horse farms and local farm stands eventually give way to stunning and sprawling vistas as you slowly climb up the mountain. The bank of the St. Croix River in Minnesota. It may be the Land of 10,000 Lakes, but Minnesota also has some worthwhile rivers to visit. If you live in or around the Twin Cities, you’re just a stone’s throw from some of the state’s most beautiful examples. The 124-mile long St. Croix Scenic Byway snakes its way from Point Douglas—just south of St. Paul—all the way to the northern town of Sandstone. But city dwellers can hop on the route with relative ease by following I-94 East for about 20 miles. 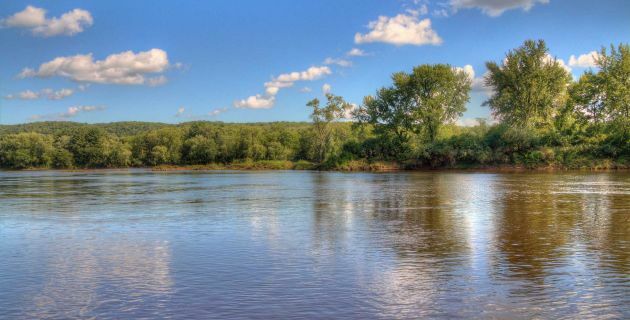 Once there, the river will be your guide: You’ll sidle up to the beautiful St. Croix while navigating the route. It’s about as close as you’ll get to kayaking without having to leave your car—although the outdoor activity is available along several spots in the road, as well as a number of other recreational endeavors like biking and hiking. Those less interested in physical activity can also stop at one of the highway’s many historical sites or museums, or browse through some nearby farmer’s markets. It all culminates at the St. Croix River Visitor Center, which straddles the border of Minnesota and Wisconsin and offers comprehensive information on the river, along with plenty more opportunities to get out there and explore it. All that—and you can still make it home in time for Sunday dinner with the family.